Research shows that contrary to the current greenwashing trend surrounding hydropower, hydroelectric dams are not the sustainable solution to the world’s energy needs that proponents make them out to be. They could even significantly worsen global emissions and global warming. Activist-journalist, Mike Gaworecki, looks at plans to build 43 large dams in the Brazilian Amazon’s Tapajós River Basin in relation to the climate impacts of dams globally and the findings of arguably the world’s greatest authority on the Amazon environment, Professor Philip Fearnside. Fearnside’s research shows that contrary to the current greenwashing trend surrounding hydropower, hydroelectric dams are not only not the sustainable solution to the world’s energy needs that proponents make them out to be, they could actually significantly worsen global emissions and global warming. Plans to build hydroelectric dams globally — especially in the Amazon and other tropical locales — are often touted as “sustainable development.” However, according to a trio of new reports, these large infrastructure projects will do enormous harm to rainforest ecosystems and indigenous peoples, while also emitting far more greenhouse gases than the U.N. and other organizations officially estimate, with potentially disastrous results. 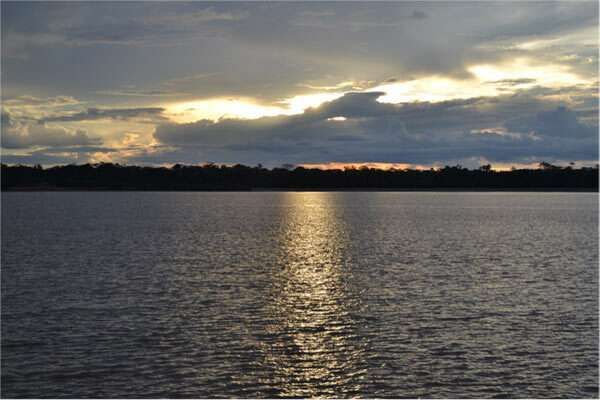 The first of the reports, published earlier this year in the journal Ambio, examines plans to build 43 large dams in the Brazilian Amazon’s Tapajós River Basin. The paper’s author, Research Professor Philip Fearnside of Instituto Nacional de Pesquisas da Amazônia in Manaus, Brazil, has amassed a large body of data showing how hydroelectric dams are not the sustainable solution to the world’s energy needs that proponents make them out to be. All of the proposed dams in the Tapajós Basin will be large enough to produce at least 30 megawatts of electricity, while a number of smaller dams are also planned. Arguments for the dams that claim they are essential to the economic development of Brazil are disingenuous, according to Professor Fearnside. Fearnside says that many of the problems exemplified by the Tapajós Basin dam proposals apply throughout the world. The dams currently planned for construction there over the next ten years would inundate 78,380 hectares (193,681 acres) of already protected land, including portions of Amazonia National Park, Jamanxim National Park, Itaituba-I National Forest and Itaituba-II National Forest. In addition to the forest ecosystem harm done by the initial flooding, the new dams would encourage far more deforestation over time as soy plantations expand in response to the enhanced ability to export ever greater amounts of product to the global market, says the report. According to the Brazilian government’s most recent ten year plan, many of the proposed dams will play a major role in transforming the Tapajós Waterway into a major thoroughfare for transporting soybeans out of the landlocked Mato Grosso state to the Amazon River, and from there to the Atlantic Ocean. Fearnside, a frequent critic of plans to build dams in the Amazon as a source of green energy, identifies “little-discussed” legal tools used by decision makers to circumvent environmental and human rights protections that stand in the way of major development projects like the Tapajós dams. “Unfavorable decisions on dam construction in Brazil are routinely reversed by invoking a ‘security suspension’ (‘suspensão de segurança‘) that allows construction to continue regardless of any social or environmental violations if halting the project would cause grave damage to the ‘public economy. '” Of course, “any hydroelectric dam has economic importance,” Fearnside points out, so a security suspension is almost always allowed to trump protections for impacted peoples and the environment. The Santo Antônio reservoir. Tropical reservoirs produce higher carbon emissions than temperate or boreal dams, a factor not considered in UN Intergovernmental Panel on Climate Change dam emission estimates. Photo credit: Philip Fearnside. The Chacorão Dam is a “particularly explosive” case: According to the report, the dam will be built on the Tapajós River in the state of Pará and submerge as much as 18,700 hectares (46,208 acres) traditionally belonging to the Munduruku people. It would be constructed to complete the Tapajós Waterway; the dam and reservoir, plus a lock system, would allow barges to cross the Chacorão River’s rapids. “There has been no ‘free, prior and informed consent’ by any of the indigenous peoples affected,” Fearnside told mongabay.com. Other dams would flood Munduruku lands that have not been designated as indigenous land, and according to the report, there is no hope of receiving that official government recognition because the process has been “paralyzed” for several years. “This ‘paralyzation’ appears to represent a policy to facilitate the flooding of areas inhabited by indigenous populations where indigenous lands have not yet been created,” says the report. There has been virtually no public discussion of Chacorão Dam impacts within the broader discourse surrounding Tapajós Basin development plans. The widespread use of “security suspensions” is not generally known in Brazil, which further stifles open debate about the merits of these big infrastructure projects. “Omitting discussion of the most controversial components of Brazil’s hydroelectric plans represents a general pattern, repeating the recent history of licensing the Santo Antônio and Jirau Dams on the Madeira River,” concludes the report. Brazil’s Santo Antônio Dam is the focus of a second paper Fearnside published this past March in the journal Climatic Change, in which he concludes that hydroelectric dams are emitting far more greenhouse gases than are accounted for in the Kyoto Protocol’s Clean Development Mechanism (CDM). Jirau reservoir. Tropical reservoirs like this one may soon replace many of Amazonia’s free-flowing rivers, with largely unknown environmental impacts. Photo credit: Philip Fearnside. The researcher sees the Santo Antônio Dam as a clear example of the need to reform CDM regulations. The project was already under construction in 2008 on the Madeira River in Rondônia state, but not approved by the CDM executive board for carbon credit until 2013. So the dam would have been built, even without subsidies from the CDM. “This means that the European countries that buy the carbon credit will emit 51 million tons of CO2 over the 10-year life of the project without any real mitigation on the other end of the deal to neutralize this impact,” Fearnside said, adding that 51 million tons of CO2 is roughly the equivalent of one year of emissions from the entire São Paulo, Brazil megalopolis. Hydroelectric dams create greenhouse gas emissions via the stratification of reservoir water. Anoxic water, with very little dissolved oxygen, sits at the bottom of a reservoir along with organic material that then turns into methane, which is over twenty times more powerful as a greenhouse gas as CO2. The methane eventually diffuses and bubbles to the surface and is released to the atmosphere. The Santo Antônio example is important, Fearnside argues, because it shows that run-of-river dams with small reservoirs still have significant methane emissions due to the stratification of surrounding bays and tributaries. Storage dams, with their gigantic reservoirs, produce even more methane emissions. 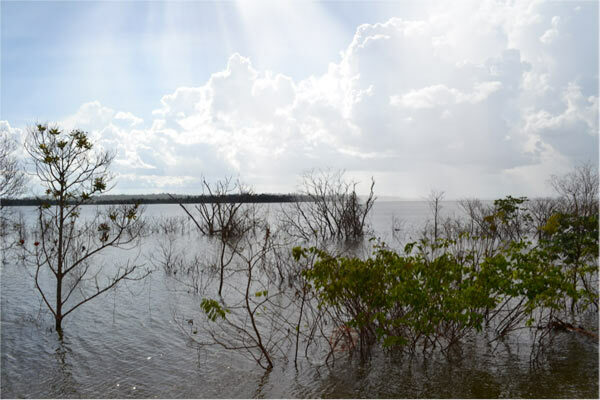 While some of the proposed Tapajós Basin projects are run-of-river dams, many are traditional storage dams. All will have major impacts on forests and Indigenous peoples, as well as a substantial climate impact. This means that hydroelectric dams are not the solution to Brazil’s long-term energy needs, especially as the world attempts to head off runaway global warming. “In terms of Brazil’s power sector, the first priority should be reducing the amount of electricity used, followed by promoting generation from alternatives such as wind and solar,” the researcher told mongabay.com. Brazil and the CDM executive board are hardly alone in under-representing the emissions of hydroelectric dams, according to a third Fearnside report to be published in the June 2015 issue of Environmental Science & Policy. The climate impacts of all dams around the globe are also undercounted by the U.N.’s Intergovernmental Panel on Climate Change (IPCC). The IPCC Special Report on Renewable Energy states that there is no consensus on whether or not hydroelectric dams are net emitters or sinks of global warming emissions. It classifies hydropower as having half or less of the emissions-per-kilowatt-hour of any other energy source, including renewable sources like wind and solar. Such global averages are dangerously unreliable, Fearnside argues, because of the large variations between dam locations. The IPCC bases its findings on a “preponderance of temperate and boreal locations among existing dams.” But much of the world’s dam-building activity in the coming decades, as the world warms, is expected to be in tropical river basins, including the Amazon, Congo and Mekong. These new tropical dams will produce significantly higher emissions than temperate zone dams. Fearnside’s calculations of emissions from the Petit Saut Dam in French Guiana serve as an example. He shows that over the first 20 years of the dam’s life, it will emit at least 19 times more greenhouse gases than by generating the same amount of energy with natural gas. This contrasts very sharply with IPCC estimates that say that all dams worldwide on average emit 100 times less CO2 than natural gas. The 20-year timeframe was chosen by the researcher because that is the time period over which the world must keep global temperatures within the 2˚C limit scientists say is needed to avert catastrophic climate change. It is important to note that the IPCC Special Report was heavily influenced by the hydropower industry, Fearnside told mongabay.com. That industry has an obvious incentive to undercount hydroelectric power emissions. The official low-balled estimates from the IPCC could make a significant difference in efforts to reduce carbon emissions and combat climate change. If big carbon credits are issued for dams that are actually high emitters, then no real mitigation is actually taking place, Fearnside argues. Carbon credits figure significantly into the global accounting of greenhouse gas emissions compiled for national reports submitted by each country signing on to the United Nations Framework Convention on Climate Change. Put simply, IPCC’s undercounting of tropical dam emissions could cause us to overshoot our planetary carbon budget, resulting in catastrophic global warming. Taken together, the three reports offer a damning case against the use of hydropower — and especially tropical hydropower — as a means of electrifying our societies while curbing climate change. Hydropower, Fearnside argues, will not only have drastic consequences for forests and forest-dependent peoples, but could significantly worsen global emissions and global warming. Fearnside, P. M. (2015). Amazon dams and waterways: Brazil’s Tapajós Basin plans. Ambio, 1-14. Fearnside, P. M. (2015). Tropical hydropower in the clean development mechanism: Brazil’s Santo Antônio Dam as an example of the need for change. Climatic Change, 1-15. Fearnside, P. M. (2015). Emissions from tropical hydropower and the IPCC. Environmental Science & Policy, 50, 225-239.